Next Monday, June 13th I am excited to be presenting at the Central Ohio Azure user group (COAzure). This will be my first time speaking at this group. Session details are below. Meeting is from 6:00pm-8:00pm at the Microsoft building in Columbus near Polaris mall. Come on out and learn more about Azure VM. Abstract: With an MSDN subscription you can run your dev / test SharePoint environment in Azure IaaS for less than the cost of a cup of coffee each day. In this session we will overview the basics of Azure IaaS (Infrastructure as a Service), the pieces you will use to be successful deploying SharePoint in Azure (including the new Azure Resource Manager templates), and how to use resources as efficiently as possible to reduce your costs and boost your farm performance. 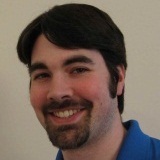 This session is targeted to SharePoint developers and administrators. Prior knowledge of Azure is helpful but not a requirement. !Note: This post is written as of the SharePoint 2016 Release Candidate. Pre-release software is subject to change prior to release. 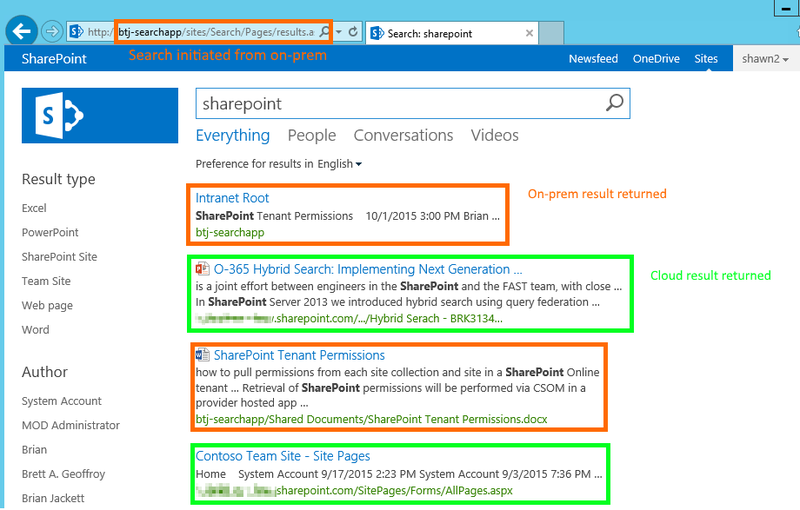 I will update this post once SharePoint 2016 hits RTM or the related information has changed! In this post I’ll walk through the steps to enable background garbage collection for AppFabric 1.1 which is used by the SharePoint 2016 Distributed Cache service. I also provide a sample PowerShell script to automate the change. Skip down to the Solution section for specific changes and a script to automate implementing the change. The change that I describe is not a new one. It was first introduced during SharePoint 2013’s lifecycle when Microsoft AppFabric 1.1 Cumulative Update 3 (CU3) was released. CU3 allowed for a non-blocking garbage collection to take place but in order to take advantage of this capability an administrator needed to update a Distributed Cache configuration file (described below in the Solution section). Later Microsoft AppFabric cumulative updates also require this same change to the configuration file. Fast forward to SharePoint 2016 which continues to use Microsoft AppFabric 1.1 for the Distributed Cache service. As of the release candidate (RC) SharePoint 2016 ships with Microsoft AppFabric 1.1 Cumulative Update 7. Since this cumulative update builds upon CU3 it also requires the same configuration file change to enable background garbage collection. Depending on server configuration, hardware, workloads being run, and more factors a SharePoint farm may or may not experience any issues with the Distributed Cache service if the background garbage collection change has not been applied. In my lab environment I simulated load (10-50 requests / sec) against the SharePoint Newsfeed. After a few minutes I began to experience issues with Newsfeed posts not appearing and eventually the Distributed Cache service instances crashed on the two servers hosting that service. A restart of the AppFabric service allowed the Distributed Cache to recover and function normally again. The configuration change to allow for background garbage collection in Microsoft AppFabric 1.1 is outlined in Cumulative Update 3. An administrator who has access to the SharePoint server(s) hosting the Distributed Cache service will need to perform the following actions. Install the cumulative update package (already installed for SharePoint 2016 Release Candidate). Restart the AppFabric Caching service for the update to take effect. ”%ProgramFiles%\AppFabric 1.1 for Windows Server” where %ProgramFiles% is the folder where Windows Program Files are installed. While it is possible to modify this file by hand it is preferred to automate this process especially when multiple servers need to be updated. The below script leverages the System.Configuration.ConfigurationManager class to make the necessary changes on an individual server running the Distributed Cache service. Note: This script must be run from each server running the Distributed Cache service. For an automated way to run on all Distributed Cache servers in a SharePoint farm see the PowerShell snippet following this script. THIS SAMPLE CODE AND ANY RELATED INFORMATION ARE PROVIDED "AS IS" WITHOUT WARRANTY OF ANY KIND, EITHER EXPRESSED OR IMPLIED, INCLUDING BUT NOT LIMITED TO THE IMPLIED WARRANTIES OF MERCHANTABILITY AND/OR FITNESS FOR A PARTICULAR PURPOSE. $configFilePath = "$env:ProgramFiles\AppFabric 1.1 for Windows Server\DistributedCacheService.exe"
# if backgroundGC setting does not exist add it, else check if value is "false" and change to "true"
Optionally the following snippet can be run from any machine in a SharePoint farm that has the SharePoint commandlets available. This will identify each Distributed Cache server and remotely run the previous script to implement the Distributed Cache configuration change. Note: Update $UpdateDistributedCacheScriptPath with the path of the above script. Also ensure that PowerShell remoting is enabled and the account running the script has access to the target machines. Write-Verbose "Modifying config file on server: $server"
Write-Verbose "Script completed on server: $server"
In this post I walked through the update required to enable background garbage collection in Microsoft AppFabric 1.1 Cumulative Update 3 and higher. This configuration change is required for SharePoint 2013 or SharePoint 2016 (as of Release Candidate). I also provided a script for automating the process of implementing this configuration change. I’m told a future update may automatically apply this change for SharePoint 2016. If and when that change is released I’ll update this post to reflect that change. Thanks to all of the attendees at my SPTechCon Austin 2016 sessions. On this blog post I’ll share my slides and demo scripts (and update it with future slide decks as I give the presentations). Note that all scripts are provided as-is with no warranty. Run them in a non-production environment first. I’m honored to be accepted to speak at SPTechCon Austin 2016 next week. It has been a few years since I’ve been able to attend / present at an SPTechCon with many life and work changes in the past 2 years. The organizers for this event put on a great conference with top name speakers, educated attendees, and a nice venue from the previous ones I’ve attended. Below are the sessions that I will be presenting along with a call out to another session by Jen Mason you should see before my PowerApps session. Abstract: PowerShell is becoming the command line interface for all Microsoft server products, including SharePoint. If you haven’t started using PowerShell you will want to add it to your set of tools in your tool belt. In this demo-heavy session we will show tips and tricks for using the PowerShell console and ISE, traverse through all sites in a farm, create reports, and create a secure remote connection with whitelisted commands through constrained endpoints. We will also cover some of the more intermediate to advanced techniques available within PowerShell that will improve your work efficiency. This session is targeted to administrators and developers and assumes a basic familiarity with PowerShell. …and more. PowerApps can connect to Office 365, OneDrive, Dropbox, Salesforce, Oracle, SAP, Twitter, SQL and more. In this session we will explore this new tool and show some demos. You don’t want to miss this great opportunity to hear about the new PowerApps features. Abstract: PowerApps is an enterprise service (currently in preview) that allows power users and developers to build scalable applications that connect with numerous consumer and enterprise sources using PowerPoint and Excel-like tools. In this session we will overview the integration points for PowerApps with various sources such as OneDrive, Twitter, Azure, and more. We will also talk about the developer story for integrating with on-prem sources such as SQL Server and SharePoint. Lastly we will demo a number of scenarios to give you a feel for how quickly and easily apps for Windows, iOS, Android, and web can be created once and consumed on all platforms. This session is targeted to information workers, power users, and developers. General experience working with Excel / PowerPoint data is helpful but not required. There is still time to register for SPTechCon Austin 2016. You can use code JACKETT to save $200 but the early bird pricing is already over. If you are attending please come say hi and I look forward to meeting you. In this post I’ll talk about PowerApps, a new enterprise service for building enterprise applications and share resources on where to find out more information. Note: PowerApps is currently in private preview and is subject to change after this article is posted. As such this article may contain out of date information by the time you read this. Additionally I am a Microsoft employee but the views and opinions expressed in this article are my own and not reflective of Microsoft or the PowerApps product group. On Nov 30th, 2015 at the European Convergence conference Microsoft unveiled a new enterprise service for building enterprise applications called PowerApps. At a high level PowerApps allows power users and developers to build scalable applications that connect to numerous services (Office 365, SalesForce, OneDrive, Dropbox, etc.) using PowerPoint and Excel-like tools to be consumed on Windows, iOS, and Android. These applications can be built once and then consumed on any platform. No need to re-compile, design separate UIs per platform, etc. like you see with the current state of most mobile or web development. 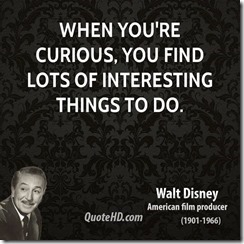 I’ll briefly walk through some of the highlights for different components or aspects of which to be aware. Currently it is possible to create and consume PowerApps apps on Windows and iOS. I can’t speak to the final plans but it is my understanding that it is on the roadmap to be able to create and consume on all platforms including Windows (PC and mobile), iOS, Android, and web. You will not be limited to only consuming from the platform that you created on though. PowerApps is designed to be able to author apps using Excel and PowerPoint type skills. There is no need to code your solution. That said if you are a developer and wish to code backend interactions or create a custom API to connect to that is available (with the Enterprise plan, more on that below). Out of the box PowerApps ships with a dozen or so connectors for pulling or pushing data to the following sources. By configuring a connector to these services you can perform simple CRUD (create, read, update, and delete) operations on data in these sources. Establishing a connection to these services is as simple as logging into the service. Once you establish a connection it is persisted to the PowerApps cloud and will be available on any device that you log into your account. Speaking of logging into accounts, authentication for PowerApps is handled by Azure Active Directory. As such you will need to have an Azure Active Directory identity / domain in order to utilize PowerApps. Thus you can view PowerApps as an enterprise solution more than a consumer solution even though you do have access to consumed focused connections (e.g. Twitter, OneDrive, etc.). PowerFlows (also called Logic Flows) are still a work in progress but the goal is to provide simple yet robust workflows for data. 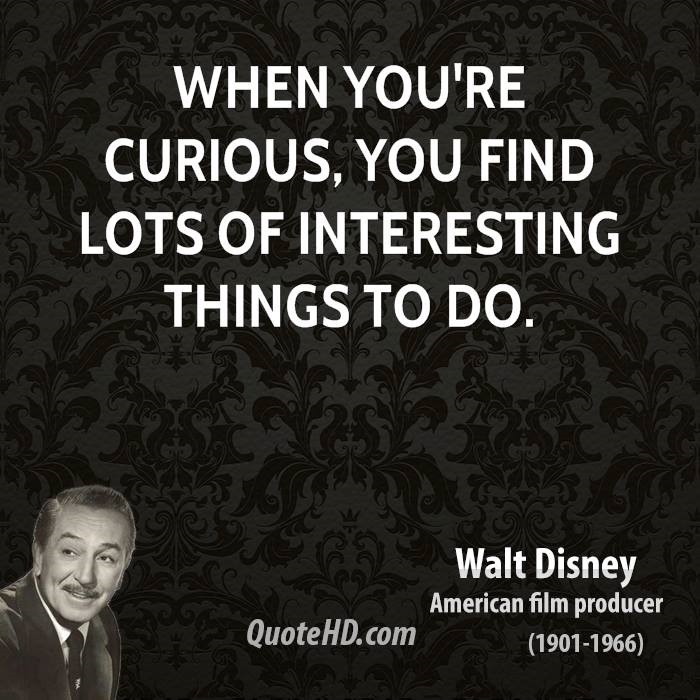 Think along the lines of If This Then That (IFTTT, www.ifttt.com) which is a popular website for connecting data from disparate sources and taking action when specific triggers are met. Ex. when the forecast is predicting rain tomorrow send me a text message and put a calendar entry on my calendar to bring an umbrella to work. IFTTT also integrates with home automation software, smartphone devices, design websites, and more. On the PowerFlows side you can define a triggers and then take actions based on that incoming trigger. Ex. when a new tweet from Twitter contains specific data create a new entry in a SharePoint list, send me an email, and then create a case in Salesforce. When used in conjunction with apps from PowerApps this can be a powerful complimentary toolset. When it comes time to share your PowerApps app with others you can simply type in their email address and share it with them. No need to worry about downloading the application, incompatibility of the OS, or other traditional blockers for enterprise applications. In the enterprise plan it is possible to restrict access to the app so that only specific users are able to view and access your app. Speaking of plans there are 3 plan levels. They are as follows. The last piece of the Enterprise plan is interesting to me. This allows an organization to package up an API to line of business (LOB) or other data (i.e. SQL Server, on-prem SharePoint, etc.) and publish it to Azure. That data source can then be consumed by PowerApps apps. PowerApps is currently in private preview but I encourage everyone to request an invite to gain access at the following URL. Note that you may not be accepted in right away but you will be added to the list for future inclusion. I am very excited to see PowerApps finally come to private preview. I have been following Project Siena (precursor to PowerApps) for over a year now and tinkering around with the alpha and beta builds of both. There is no release date yet for PowerApps but I encourage you and your organization to sign up for the preview and take a look at the videos and tutorials linked below. Lastly a few parting thoughts. Think of all of the LOB apps that exist in your company or organizations and all of the time, effort, and money that goes into developers and / or designers creating and maintaining those applications. Many of these applications are simple data entry, approval workflow, or similar type applications. By exposing enterprise data in a structured and secure manner you can empower end users to create those types of applications much more quickly while freeing up resources and people for other business needs. 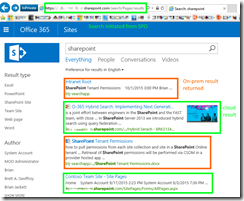 In this post I’ll talk through my personal experience deploying the new cloud hybrid search service application for SharePoint 2013 (also available in SharePoint 2016). By no means am I an expert on this topic (especially in many of the supporting technologies such as AAD Connect, AD FS, etc.) but this is more meant to increase exposure to this new offering. For an overview of cloud hybrid search and more information about actual implementation (which I will refer back to later) please read through Cloud Hybrid Search Service Application written by two of my Microsoft peers Neil and Manas (they are the true experts). Here is a list of the high level components I used for my deployment. Note: My Azure VM configuration is not using best practices for where or how to deploy different services. Also my mention of GoDaddy and DigiCert are purely for example purposes and not an endorsement for either company. I just happen to use their services and products in this scenario. Next we’ll take a look at some of these components more in depth. 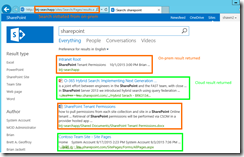 The new cloud hybrid search service application is available in SharePoint Server 2013 with the August 2015 CU or later. I have heard from my peers that there are some issues with cloud hybrid search as of the October, November, and December 2015 CUs. As such use either the August or September 2015 CUs at the time of this writing (Dec 8, 2015) or wait until the Jan 2016 CU which should contain the fix (link). The SharePoint Server 2016 IT Preview 1 also supports cloud hybrid search although I have not tested it out myself. To provision a cloud hybrid search service application the property CloudIndex on the service application must be set to True. This property is a read-only property and can only be set at creation time. As such you will need to create a new search service application in order to utilize the cloud hybrid search service. I have not tested creating a new cloud hybrid search service application using a restored backup admin database from an existing search service application. The thought behind this would be to retain at least a portion of your existing search service application. If you try this and have any findings let me know in the comments below. A custom domain is not a requirement for cloud hybrid search. I used one so that I could allow end users (demo accounts) to log into Office 365 as a federated user “someUser@<fakecompany>.com” rather than the default domain “someUser@<O365TenantDomain>.onmicrosoft.com”. In order to search for on-prem content that has been indexed by Office 365 the user will need to have an account that is synchronized to Azure Active Directory / Office 365. This allows the search service in Office 365 to show content based on the Access Control List (ACL) defined on-prem. There are multiple options available for synchronizing accounts between on-prem and AAD but the predominate ones include DirSync, AAD Sync, and AAD Connect. Since AAD Connect is the future looking tool of choice of these three I decided to use it. AAD Connect automates many of the tedious tasks of configuring federated authentication by stepping through a wizard. That said I did run into a number of issues during configuration due to missing certificates, invalid permissions, or other steps I missed or was unaware of. If I got part of the way through the configuration and ran into a failure that I couldn’t recover from then I had to uninstall AAD Connect (do not remove all prerequisites when prompted), wipe out the contents of “<install drive>:\Program Files\Microsoft Azure AD Sync\Data”, and then re-install. The default scenario for cloud hybrid search is to index both on-prem and O365 content which are then queried in O365. It is possible to create or modify an on-prem result source to use the remote index from your Office 365 tenant which allows for querying and display the combined search results on-prem. The problem though is that when you query for and click results on-prem the search analytics click data is not incorporated back to the cloud index to further influence search results. Ex. 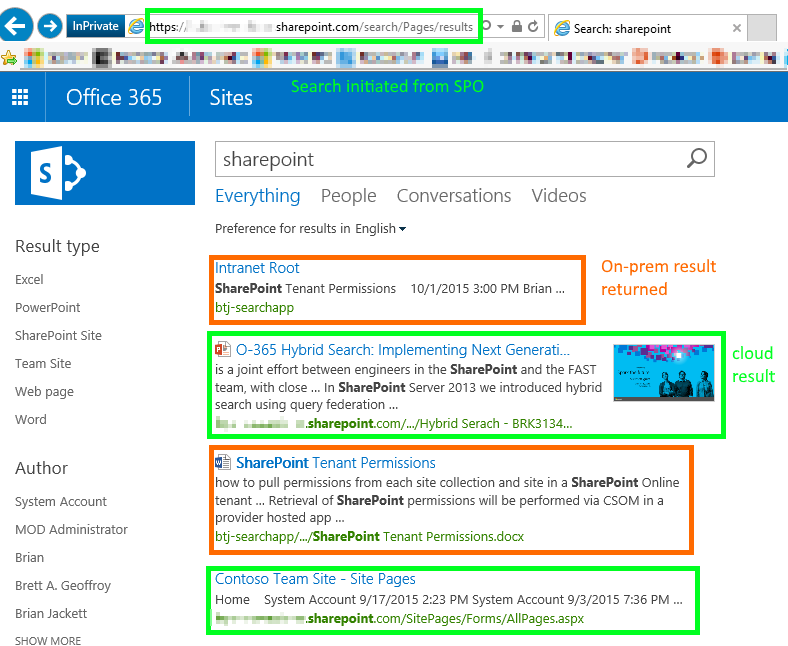 I queried for “SharePoint” in on-prem search center and clicked the 4th result on result page. Multiple other users also searched for “SharePoint” and clicked the same 4th result. SharePoint search (via timer jobs and other background processes) incorporates that click data and adjusts the 4th result to now appear higher in rankings upon subsequent search queries. I have unsuccessfully tested a few options to manually pass the search click data up to SharePoint Online. These include creating a ClientContext object and calling the RecordPageClick() method on SearchExecutor, modifying the display template page, and more. I did hear from a SharePoint MVP that successfully tested out a way to push search analytics data between on-prem and O365 but it took a fair amount of customizations to accomplish. If I find out any additional information, workaround, or updates on this topic I’ll update this post to reflect that. As you can see from the below screenshots I can initiate a search query from on-prem or O365 (respectively) and get the same combined result set. Due to my prior inexperience around AD FS, Web Application Proxy, AAD Connect, and other applications it took me a few days to get everything working end-to-end. After that small hurdle I was very excited to be seeing combined on-prem and O365 search results in both on-prem and O365. Do note though the section above calling out the current issue with search analytics data not being sent back and forth. Aside from that I am looking forward to testing this out with customers and reaping the many benefits such as inclusion of content in the Microsoft Graph (formerly Office Graph) / Delve and other O365 only offerings. In this post I’ll walk through a workaround to the “There are no locations available. You may not…” error when trying to provision a new instance of Azure DevTest Labs in the current preview (as of 2015/10/12). A few weeks ago during AzureCon 2015 there was an announcement that the new DevTest Labs offering was available in preview. For those of you unfamiliar Dev Test Labs allows an administrator to set quotas for money used per month, size of VMs available, automatic shut down times for VMs, and more. I immediately tried to register and followed the instructions to wait 30-60 minutes. Later on I saw the DevTest Labs section available in the Create blade (note this requires using this link from the above page which as far as I can tell includes the “Microsoft_Azure_DevTestLab=true” querystring parameter to “enable” the DevTest Labs pieces in the UI). When I attempted to create a new instance of a DevTest Labs I ran into an error stating that “there are no locations available”. I waited a little while longer and refreshed the browser but still had the same issue. Today even days / weeks later no change and still the same error. Thankfully I ran across a support forum post that led me in the right direction to resolve the issue. As a fellow forum poster “runninggeek” mentioned there was an issue with the Microsoft.DevTestLab provider in my subscription. Others who registered after me did not have this problem as a problem with the registration backend was fixed shortly after this announcement went out. Here is the PowerShell script I ran to workaround my issue. You can also download from my OneDrive. Essentially you need to connect in Azure Resource Manager mode and unregister the Microsoft.DevTestLab provider. Wait until the provider is unregistered and then re-register the provider. Close all browser sessions logged in to the Azure Portal and re-launch it from the appropriate link. Hopefully very few people ran into this issue as it appears to be caused by the timing of when you registered for the Azure DevTest Labs preview. Thanks to “runninggeek” for pointing me in the right direction to resolve this. I provisioned an instance of DevTest Labs this afternoon and starting to pour through documentation and the initial set of offerings. Thank you to all of the attendees at my “Running your Dev / Test VMs in Azure for Cheap” presentation at SharePoint Saturday Cincinnati 2015 (or as the locals liked to call it ScarePoint Saturday Spookinnati due to the Halloween theme.) The slides and scripts from my presentation are below. Enjoy.